Within a few decades, quantum physics will reshape society as we know it. This will include the quantum computer, among other things, now being developed by researchers worldwide. The Villum Foundation has provided 30 million kroner in funding for a new research center at the University of Copenhagen where quantum computer software is to be developed. Additionally, the Centre will generate knowledge about what quantum information consists of, how it behaves in space and time, and how in the future, it might be used to for teleportation, among other things. Researchers from around the world attended the Centre’s inauguration on 8 November. The Villum Centre of Excellence for the Mathematics of Quantum Theory’ (QMATH) is based at the University of Copenhagen’s Department of Mathematical Sciences and will focus on an interdisciplinary field where mathematics, computer science and physics combine. Among his other positions, Professor Jan Philip Solovej has served as a professor at Princeton University for a number of years. “Describing the exotic phases of quantum matter requires highly advanced mathematical concepts. Some of the mathematical models highlighted by the Nobel Committee were developed by our closest international partners. At QMATH, this area forms a large part of our research efforts,” continues Professor Jan Philip Solovej. The Centre was inaugurated on November 8, 2016 with presentations from leading researchers and 70 Danish and international participants. University of Copenhagen Prorector Thomas Bjørnholm and Villum Fonden Research Director Thomas Sinkjær was also be in attendance. As with a classical computer, a quantum computer includes software and hardware. The hardware is being rapidly developed, but remains far from any commercial implementation and new theoretical solutions for a number of fundamental challenges are still required. Therefore, there is a tremendous focus on the theory portion by leading international universities (ETH Zurich, Caltech, MIT, etc.) and IT companies (Microsoft, Google, IBM). QMATH is a theoretical centre that operates in an interdisciplinary borderland where computer science, mathematics and physics meet, and will closely collaborate with companies and universities in the area, including Microsoft and ETH Zurich. The ‘Villum Centre of Excellence for the Mathematics of Quantum Theory’ (QMATH) is based at the University of Copenhagen’s Department of Mathematical Sciences. The Center is headed by Professor and Centre Director Jan Philip Solovej, Professor Matthias Christandl and Professor Bergfinnur Durhuus. 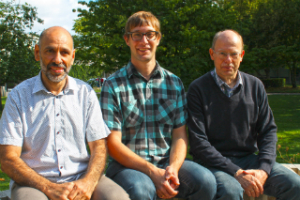 Their expertise in mathematical physics and quantum information theory is internationally recognized and has been awarded with several prestigious Danish and European research grants. 15 PhD students and postdocs are currently affiliated with the Centre. The aim is to contribute to the mathematical understanding of quantum physics, with a special emphasis on the interaction between quantum matter and quantum information. The Centre's research area is an intersection of mathematics, physics and computer science, and is stimulated by the recent discovery of surprising aspects of theoretical information in quantum physics and the potential exploitation of quantum communication, that in the long run, can lead to the development of a quantum computer. Quantum physics was developed at the start of the 20th century to describe atoms and molecules. It has revolutionized our world view and challenged classical understandings, including that of Niels Bohr's atomic model from 1913.